Prepare yourself. I’m going full “Arrested Development” fan girl in this post. Today was a terrible day from start to finish. My plans got hijacked by a situation entirely beyond my control.. I quite literally did not accomplish a *single* thing on my to-do list, despite working non-stop from 6 AM to almost 4 PM. Made myself sick, because once the adrenaline wore off and I shifted out of emergency mode, I realized that I’d not eaten in nine hours. Oops. We’ve all been there, for one reason or another… one needs to recover from days like this. Good thing I know how to make an insane chocolate smoothie! Not only is it yummy, but it makes me think of a TV show that’s brought me tremendous joy for over a decade now: “Arrested Development.” It’s been a coping mechanism of choice for a long time now, and has seen me (and several of my closest friends) though days FAR worse than today. Strap in, folks. Chocolate therapy is about to begin. There’s ALWAYS money in the Banana Stand. I could make Arrested Development referenced all day if you wanted me to… No? Oh. Alright, then. This is an EPIC smoothie. Intentionally thick, and high in both calories and protein, it’s perfect for breakfast. If you aren’t a glutton like me, you should probably have half for breakfast, and refrigerate the remaining half for dessert, or a snack later in the day. 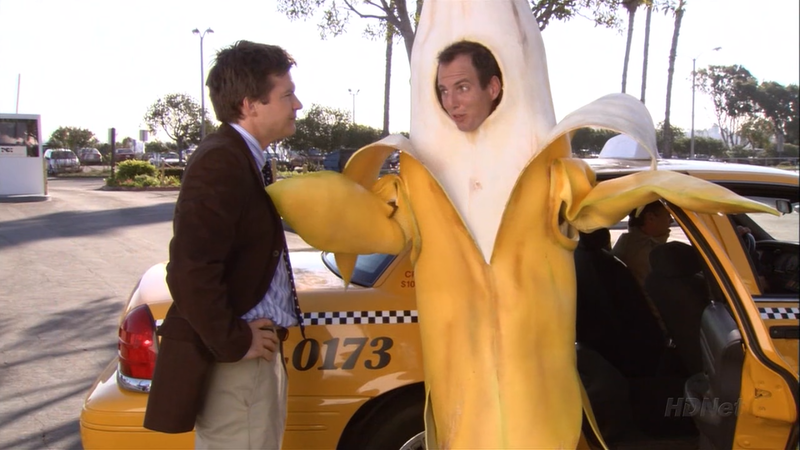 The Bluth Banana in all her glory! If you’re catching the smoothie bug and want another recipe to tide you over until my next post, check out The Strawberry Banana Debacle!